Following on from our blog post about tail shapes, let’s take a look at the chilli on the hot dog, the butter on the sweetcorn, the Romeo to the Juliet. We’re talking fins here, people. If the tail is the carriage, the fins are the horse. Ok, enough analogies already. The fins of your board are fundamental to how your board handles, and while Johnny is the expert on fin placement so you don’t have to be, it’s good to understand the fundamentals, starting with the fin itself. A larger fin will generally have more hold and provide control in bigger surf. A smaller fin is going to be more forgiving and loose, but will have less drive and control in bigger surf. This applies both the height of the fin and the length at the base of the fin. It also applies to the ‘rake’ – the amount the fin sweeps back. More rake/lean = less pivot, more hold and drawn out turns. Simples. Then there’s ‘cant’ – how much the side fins lean outwards – and ‘toe’ – how much they point in towards the nose. Too much and your board will too loose and lack drive, too little and the board will only want to go straight down the line. 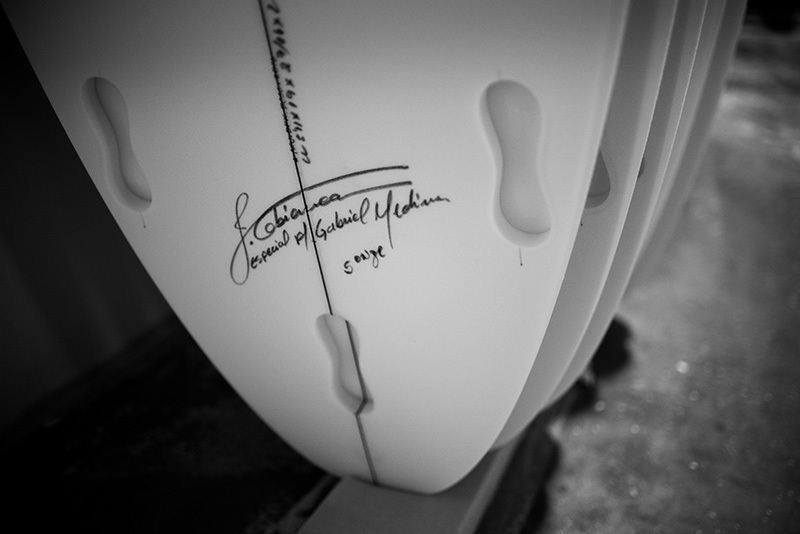 Add some ‘foil’ – the aerodynamic shape from front to back of the fin that generates lift under the board. And then, of course, there are all the setup options. 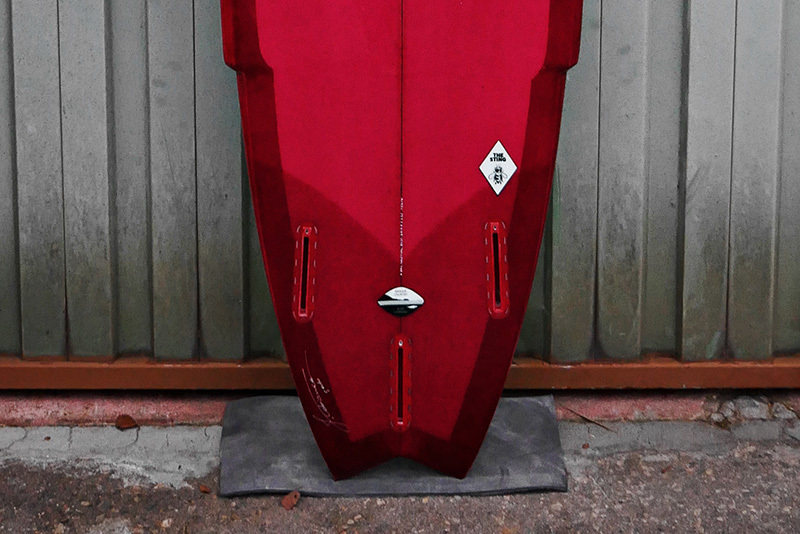 Fins placed further to the back of the board will be stable and generate lots of drive down the line, further forward will generate more lift and looseness, better for smaller surf. 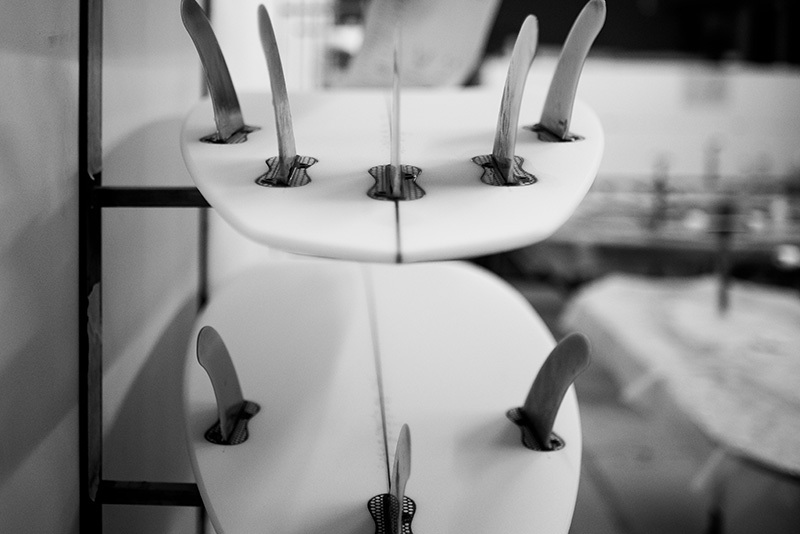 Fins spread out work best for step-ups and guns; closer clusters are better for looseness and responsive turning. While your shaper will decide most of this for you based on the kind of surfing you’ll be doing, it’s always interesting to take a few different fin options out on the same day to get a feel for the differences. Also, try putting in a small centre fin on a Thruster for extra looseness on a small day, or swap around the front and rear fins on a quad for more hold on a big day. 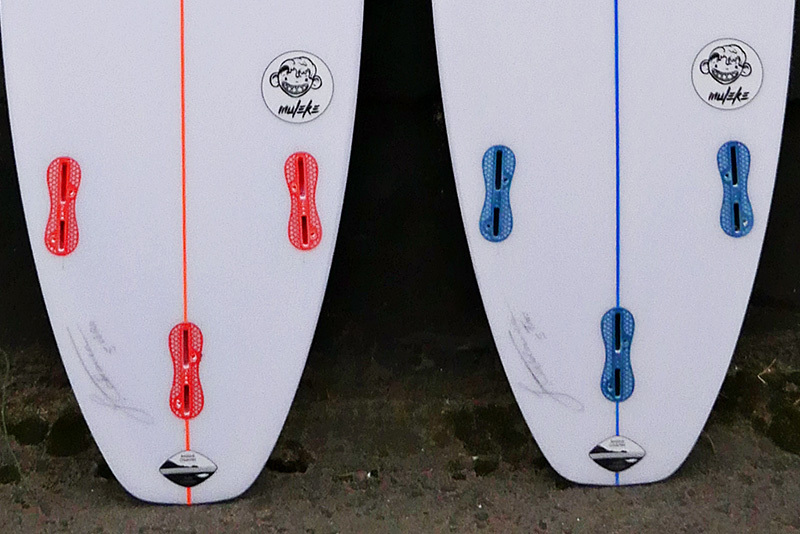 The one thing most surfers have an opinion about is how many fins make the magic number. Old skoolers like the cruisy, drawn out lines and low drag of a single fin, while retro loving hot doggers like the looseness of a twin fin. Most shortboarders ripping good waves tend to like the balanced blend of drive and control that the classic three fin thruster delivers: that centre fin helps prevent drifting when you’re really carving a turn. Others like the quad for how it blends the looseness and speed of a twin with the drive of a Thruster, minus the drag. Of course, if you’re really torn between a quad and a Thruster, there’s always the five-fin option to consider… provided the board isn’t designed specifically for one or the other, this option delivers the most versatility in different conditions as you can switch between the two setups. You can even add a mini centre keel to a quad setup to really fine tune the ride… fins are definitely a fun rabbit hole to go down! Pepsi or Coke? Two brands dominate the market: FCS have the bigger market share, but Futures are slowly catching up. FCS have a bigger selection of fins and are easier to fix & find if you’re off the beaten track. Meanwhile their new FCS2 system is both stronger than the original and allows you to quickly swap out fins without a tool. But, Futures are generally regarded as stronger all round, with surfers reporting less broken fins and shapers reporting less busted fin boxes. They’re slightly cheaper, and with only one screw compared to FCS’s two, they’re quicker to swap in and out. Both systems are good and have their pros and cons. We usually recommend the fin system the client already has fins for at home. hi Frank, we will get back to you by email. Thanks for your message! Dear Mr Cabianca, I noticed that Gabriel surfed so much better on his early waves at the surf ranch pro contest, but it seemed like he was sliding out too much on his later runs, occasionally, but ocasionally still pulling off the big moves. On his first run he seemed so quick and hooked in and spontaneously accelerating all over the place, remaining casual and surfing high on the face, but in later runs was spending too much time on the lower half of the wave face, trying to surf more vertically, which was keeping him from running with the super fast sections, which were unpredictably different on each wave un the same parts of the run. It seemed like in his later runs he had switched to smaller fins, but in the final runs, he just made the board work anyway through shear talent ant determination. I am a surfboard shaper/designer since the early sixties. So i am interested in these things. But i think that you are one of the most impressive and remarkable shapers that i have ever seen. And i am very impressed with the clear difference in your boards from others, because you are on to the same thing ive been on to since the early seventies, but the industry demand pulled me away from it. You have had the guts to stay true to your own way, seperate from the push of the main stream. Congradulations on your good work and awesome results. Gordon Quigg.